One of our newest volunteer members, Darren Longden, has been working on the former Westrail (M199) coach which is in the workshop for panel and paint work. The exterior paintwork has been given a face lift and is looking fresh and bright. Darren says he has more to do on the roof of this 1987 Mercedes Benz to complete the job of providing some much needed TLC. 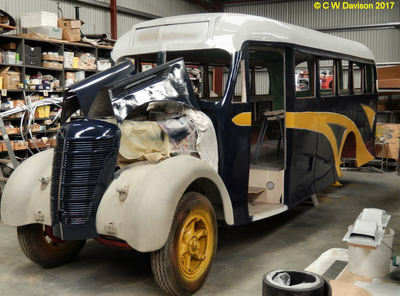 Although it may be standing room only for now inside this 1950 AEC Regal Mark III, restoration efforts have turned to placement of the seats and sourcing of the replacement flooring. 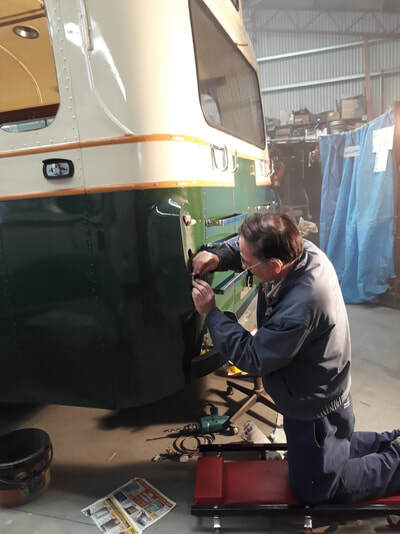 The work continues on the outside too, as our dedicated electrician Bruce, puts the finishing touches to the external rear light fittings. 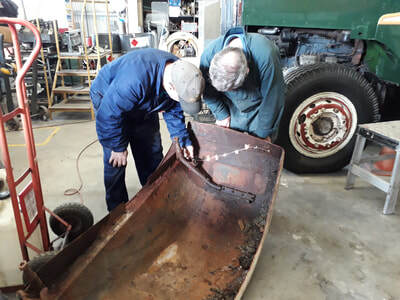 As the saying goes, "two heads are better than one" as these two industrious restorers inspect old parts to determine their viability as spares. The cold weather has not slowed our team of volunteers. 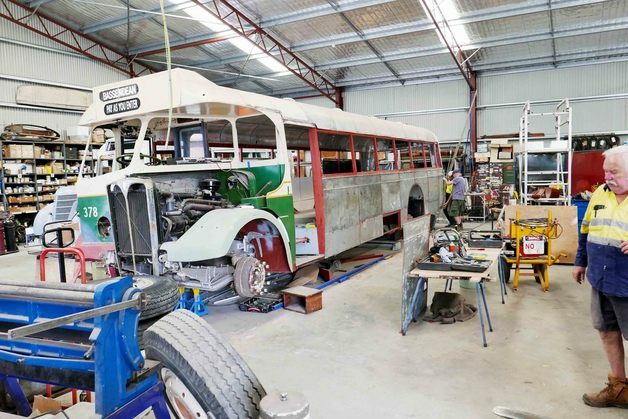 There's a million things to do to restore and preserve a fleet of heritage buses. 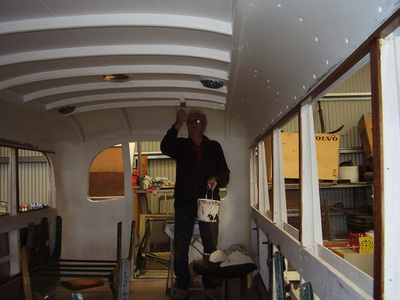 John Worley works on the rear panels and light fittings of MTT 378 restoration. 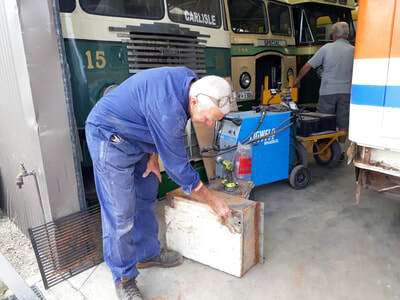 John Young has brought our 1967 Leyland Lion PSR1/1 over the pit for some overdue maintenance. 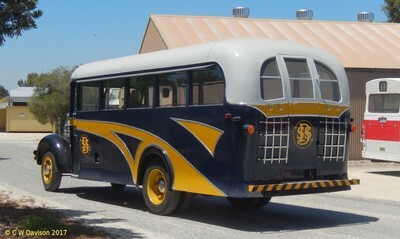 The bus is licensed for the road but has been in storage for a number of years. The bus (also known as DP90) has been in the BPSWA collection since 1983 when it was donated by West Australian Government Railways. 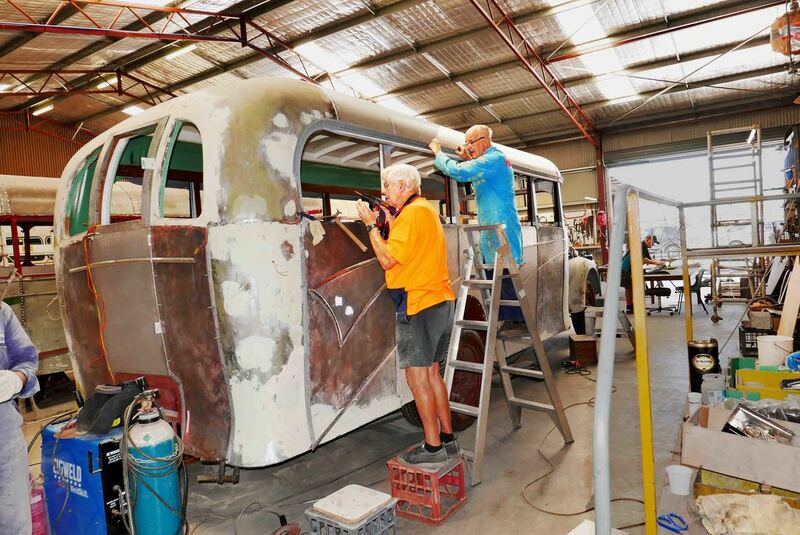 General workshop activities kept our other volunteers busy with grinding, welding, scrapping and clean up. 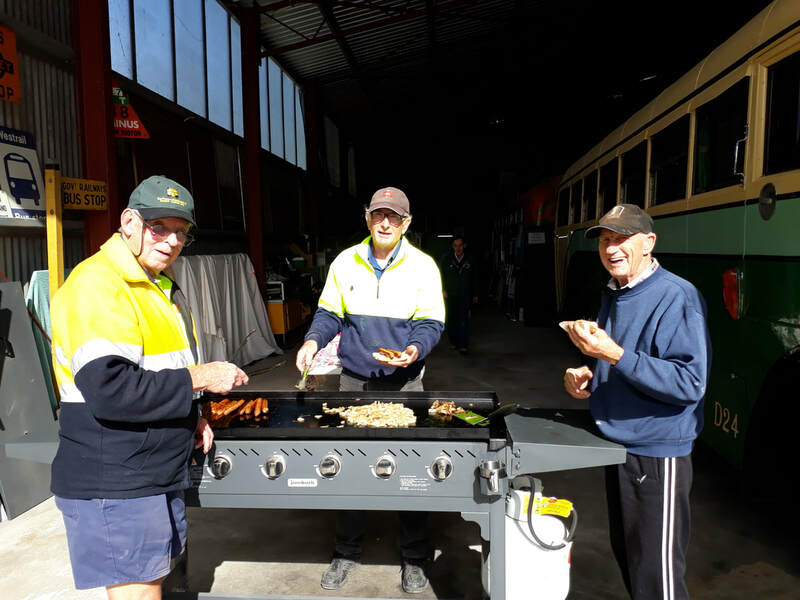 ​The 1st Tuesday of the month is BBQ Tuesday so our volunteers finished the day with a lunch of sizzling sausages - just the thing for a cold July day. 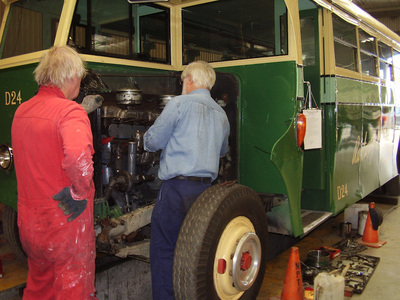 Would you like to join us and become involved in our restoration projects? Click here to Contact Us. Tony's On A Winning Streak! One of BPSWA's most recent recruits, Tony, is on a winning streak. After successfully completing driver training in some of our heritage buses, Tony also completed his first solo "mission" driving the scheduled shuttle service around Whiteman Park in our 1977 Mercedes Benz O305 (MTT 171). 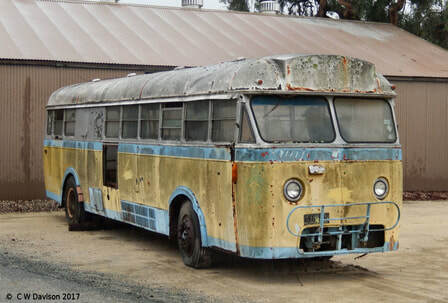 Read more about this bus here. 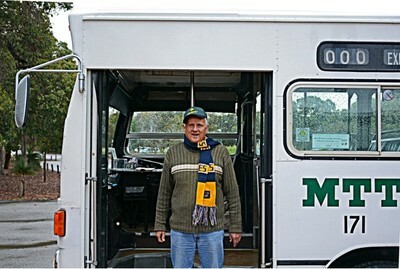 Tony also knows how to pick a winning football team as evidenced by his West Coast Eagles scarf! 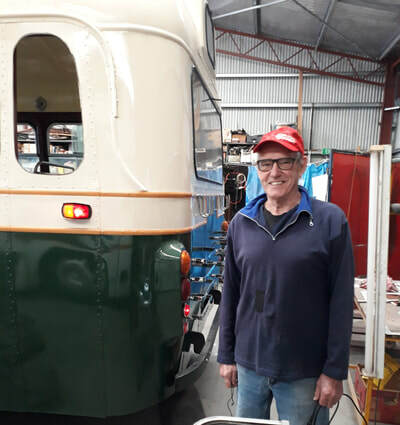 Looking very smart in its MTT livery is MTT 452 which was in the workshop this week for maintenance on the batteries and starter motor. 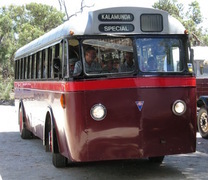 This bus is used regularly on the Whiteman Park Explorer tours and needs to be in tip top condition. The bus has also recently received an update to its front route numbers. It can now display a full range of route numbers from 001 to 999 plus the special 000. Photos and update courtesy of C Davison. 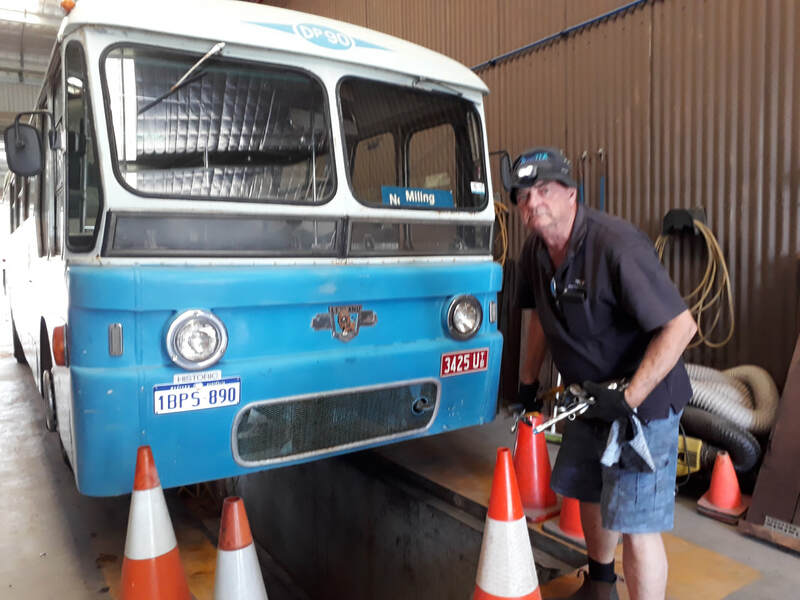 "I believe in starting them young"​, said BPSWA Member, Tom, who took his grandson for a "driving lesson" on one of the old buses in the workshop. 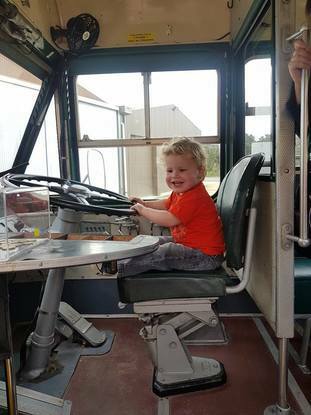 The big smile says it all - this little fellow is already hooked on beautiful old buses. The Bus Preservation Society of WA (Inc) encourages family participation in its activities. Our membership categories include Adult, Concession, Family and Associate members (students and <18 yrs). Contact Us or Join Us if you would like to participate. 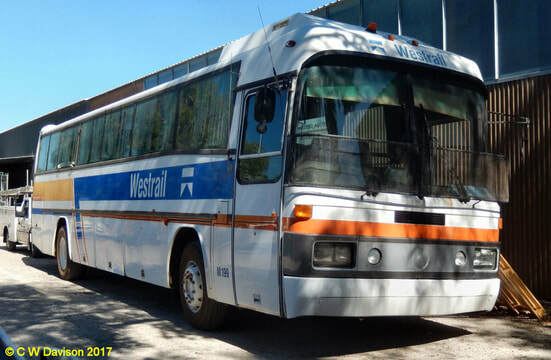 This 1987 Mercedes Benz Coach also known as Westrail M199 was donated to BPSWA in 2017. A thorough check of the body when the bus arrived at the workshop revealed several areas of rust and corrosion. Kevin has also been repairing the water tank whilst colleague and fellow restorer Reg Goddard worked on repairing the front steps. 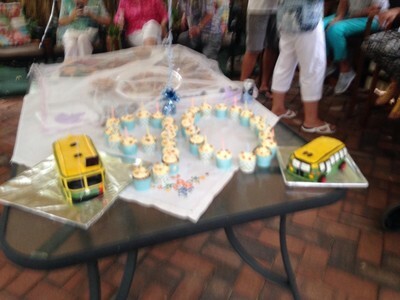 Buses, and much, much more! 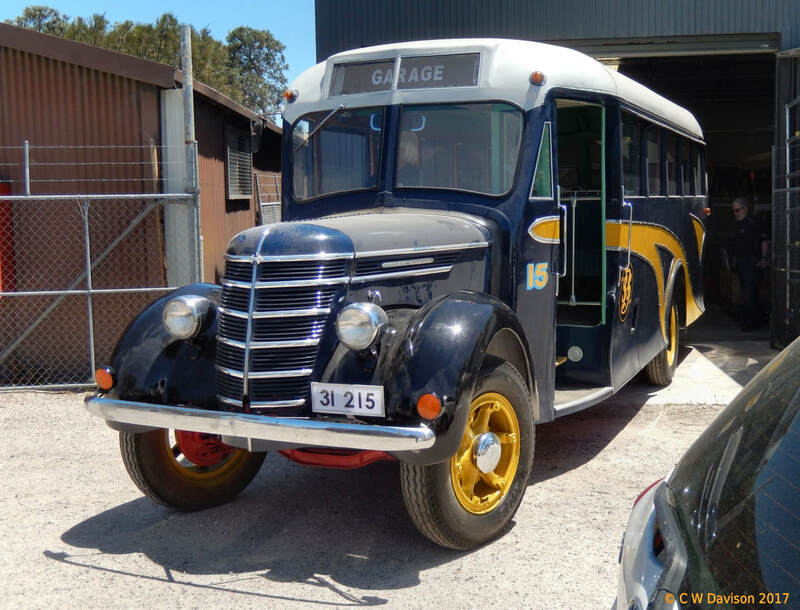 In addition to our extensive collection of heritage buses, BPSWA also collects photos, memorabilia and artefacts relevant to the bus transport history in WA. 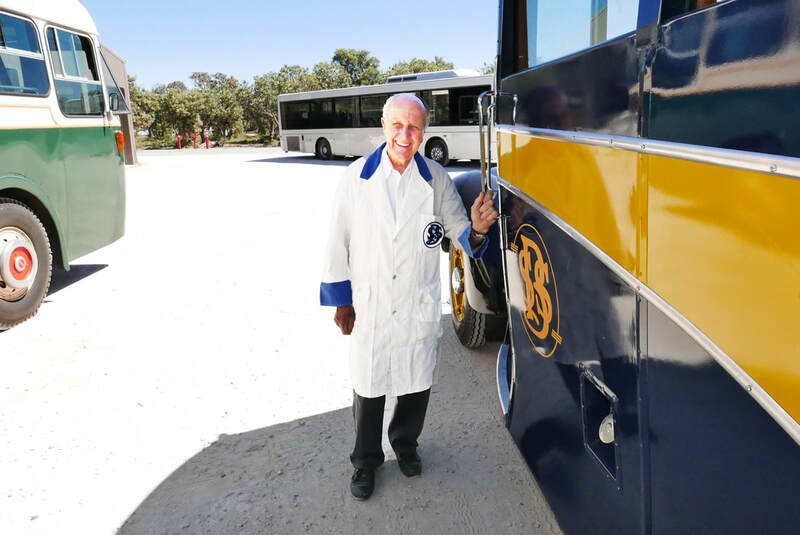 These items from the many different bus companies include driver uniforms, tickets, ticketing machines, fare notices and various other items that were used by the bus companies and their employees in the day-to-day delivery of services. Cataloguing these important artefacts of our history is an essential and ongoing task. 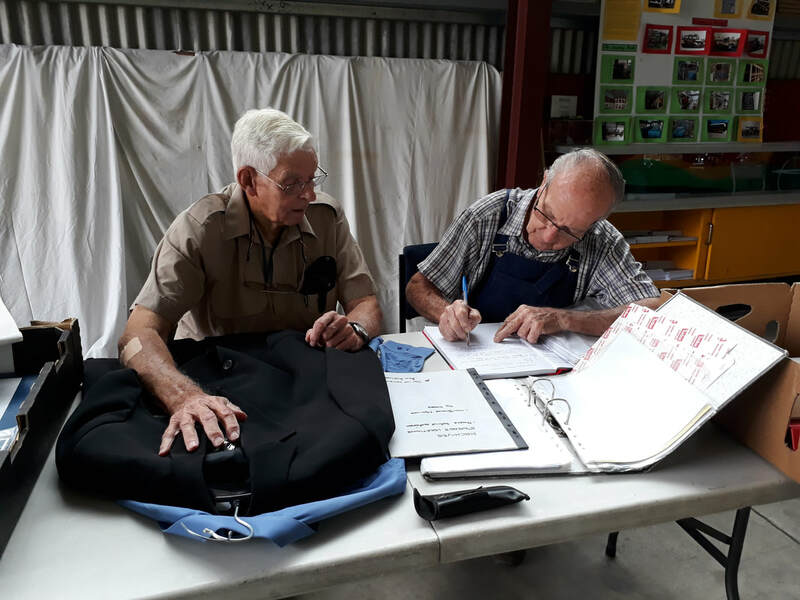 Pat Hallahan and Bill Allnutt are seen here cataloguing uniforms donated by Dave Tierney, a current BPSWA member and former Perth Transit Authority employee. 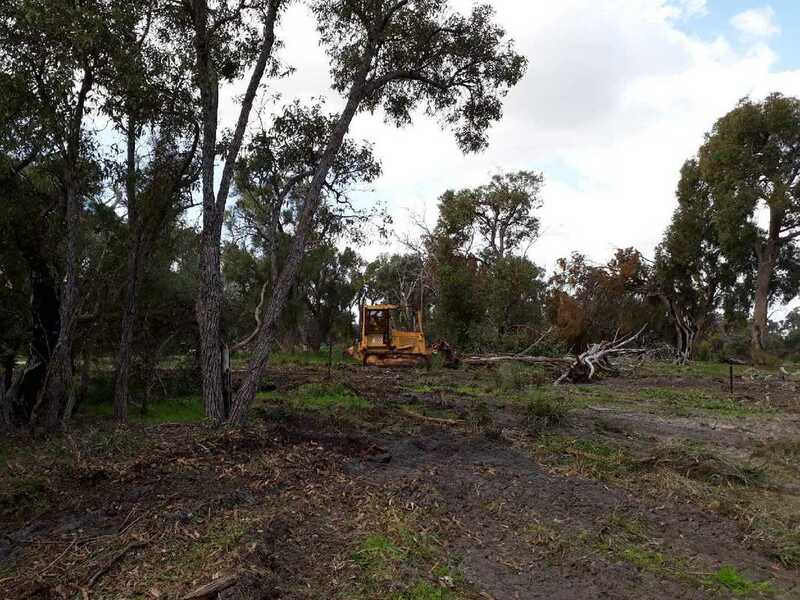 From bush block to usable parking/storage space - clearing, surfacing and fencing of the BPSWA southern lease area is now complete! 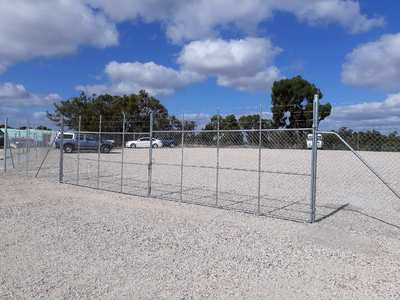 Steps and hand rails to the personal access gate are in position and the vehicle access gates at the top and lower end of the block are in place and ready for lockup. 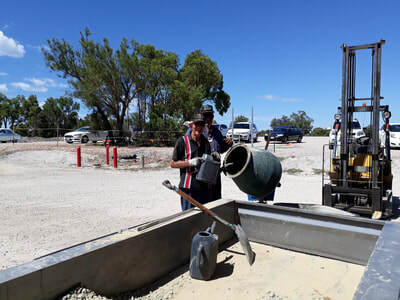 Multi-talented members Phil Gates and Ron Franklin are shown at work on the cement mixer during fencing whilst Ron McDiarmid steps aboard the digger for the 90 post holes needed for the perimeter. 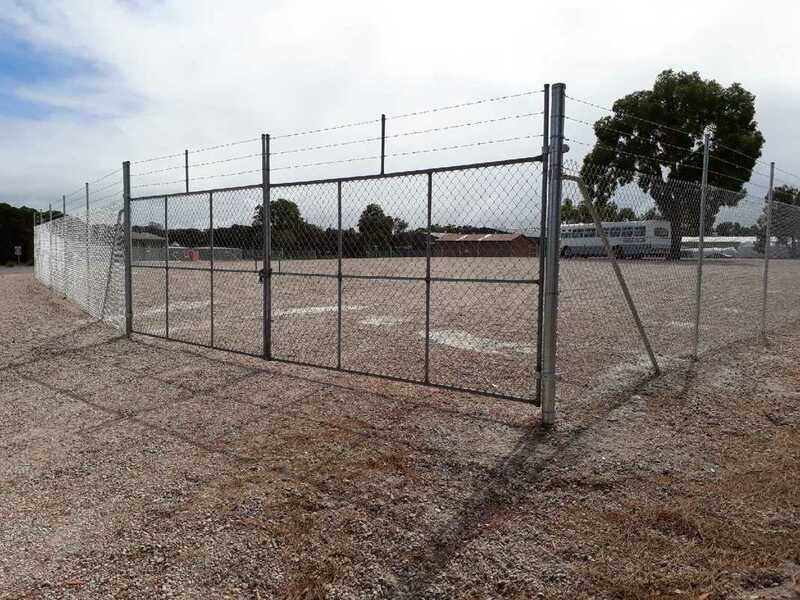 Sincere thanks to BPSWA member Greg Shemeld who donated the use of his fencing equipment which made the job so much easier and more economical! Over the past months, there has been a steady stream of BPSWA volunteers of all ages and capabilities giving their time and efforts to bring the project to successful completion. 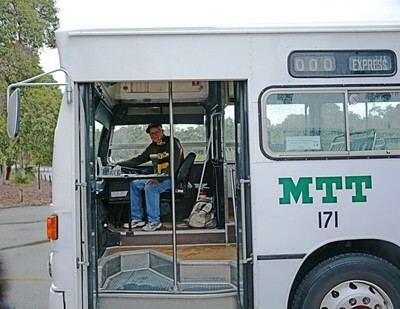 All Aboard For a Quick Tour! 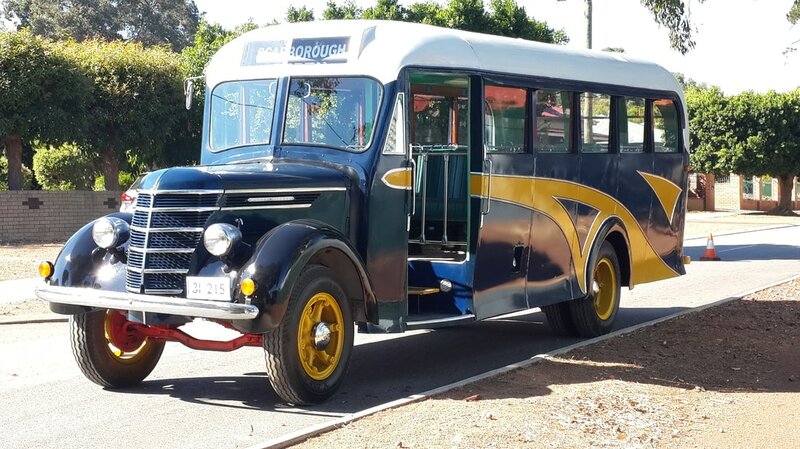 On a fine Sunday in March, a group of transport enthusiasts from the south-west city of Bunbury was visiting Perth and Whiteman Park. BPSWA member Pat Hallahan gave the visitors a quick guided tour around the park in our 1938 International D35B - aka SBS15. 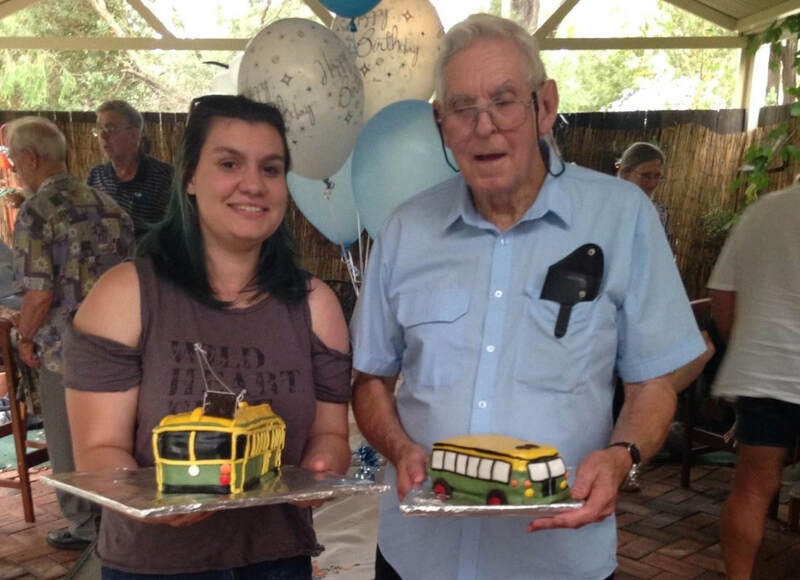 Celebrating his ​90th birthday recently was Bill Allnutt, a long time volunteer who works every week at both the Bus Preservation Society and the Perth Electric Tramway Society at Whiteman Park. Bill worked tirelessly on the recent restoration of International D35B SBS15, where his knowledge, skills and persistence were greatly appreciated by the team. 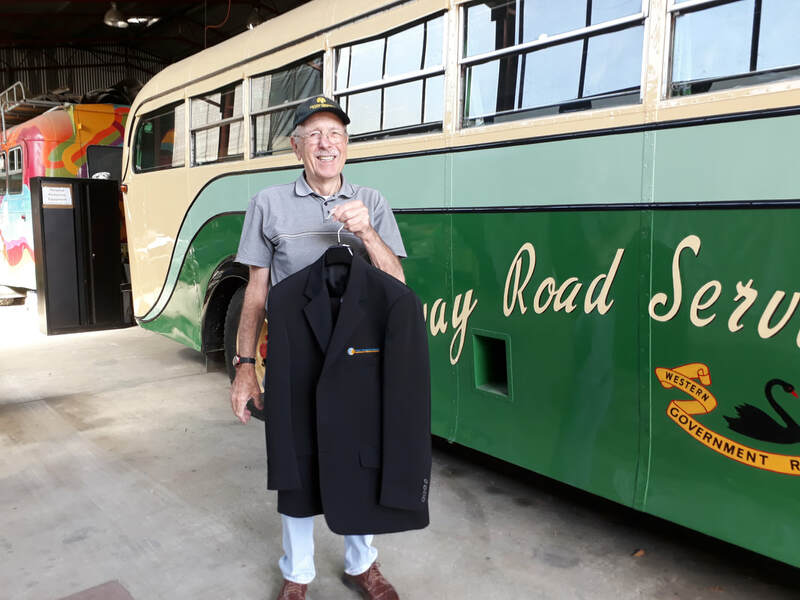 But it's not only bus restoration work that Bill applies his skills to, he is currently working on our extensive collection of artefacts and memorabilia. Below, Bill's assistant Olivia displays the birthday cakes - a bus and a tram of course. 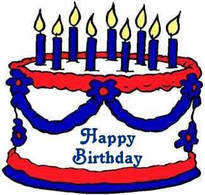 Happy Birthday Bill from all your friends, you are an inspiration to us all! 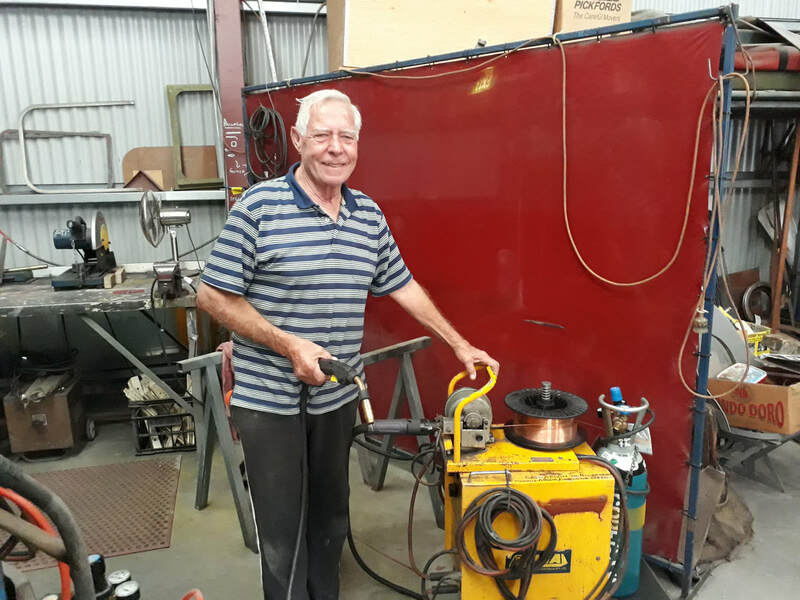 One of our regular volunteers every Tuesday is Trevor Bindeman who has generously donated this MIG welding machine to BPSWA for use in the workshop. 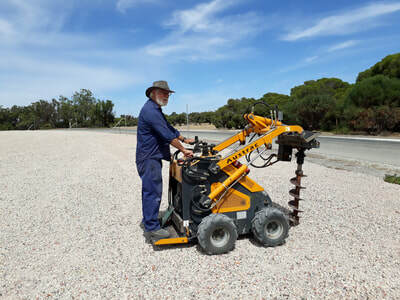 Trevor says it's a good machine and in good condition too. He hasn't used it for a while and felt it may as well be put to good use. Thanks Trevor! 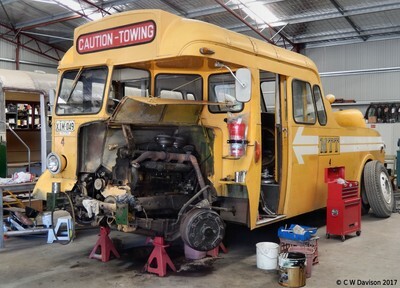 Tow truck stripped down for repair. 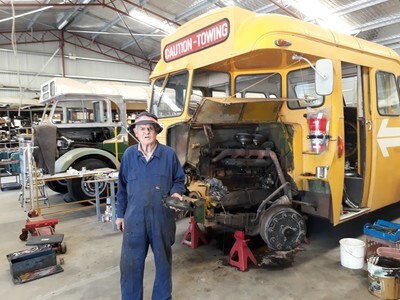 George gets stuck into the repair work on OPS4. 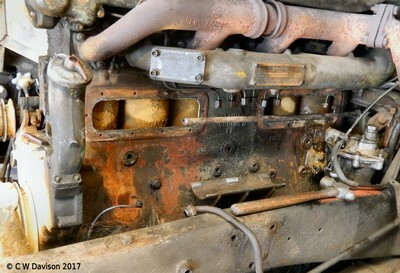 The engine with corroded side-plates removed. 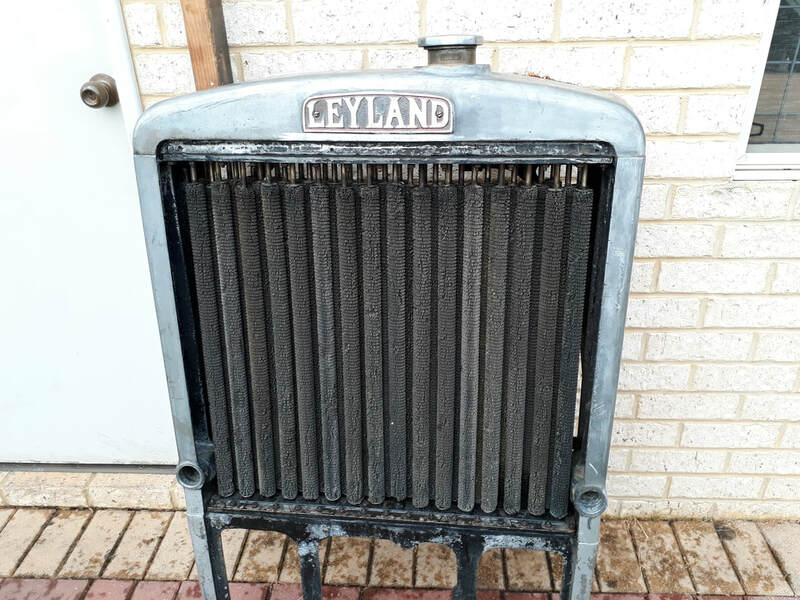 The repaired radiator had 96 seals replaced. 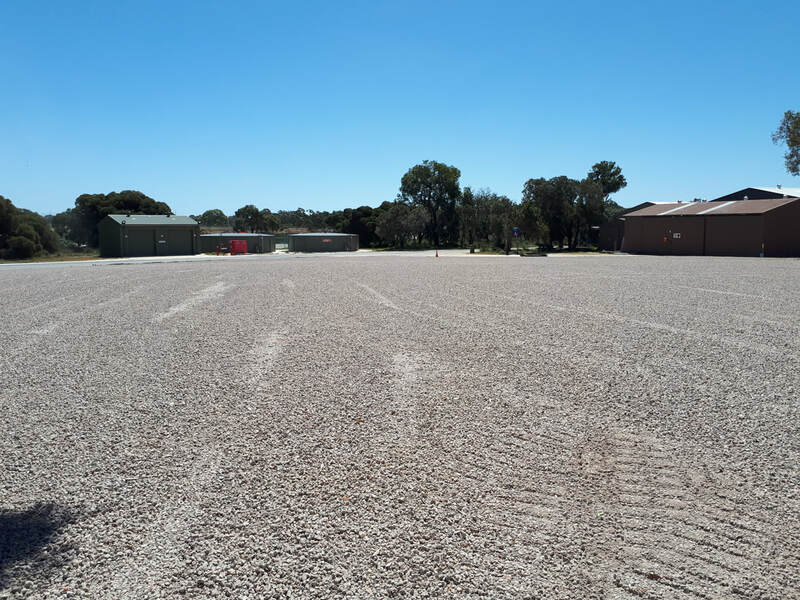 Over the past few weeks, work has progressed on the new bus parking and storage area adjacent to the workshop at Whiteman Park. 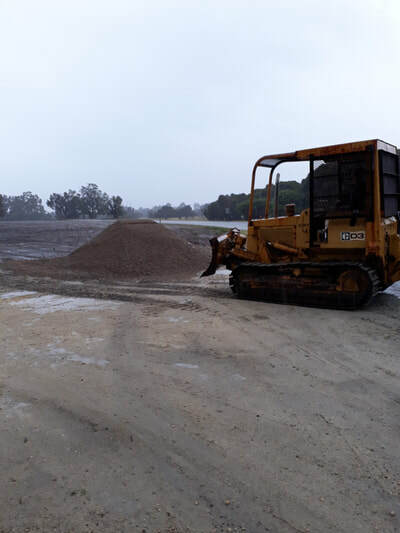 Rain slowed us down for a little while but the road base surface is now complete. Loads of road base start to arrive early October. Working through the rainy days. 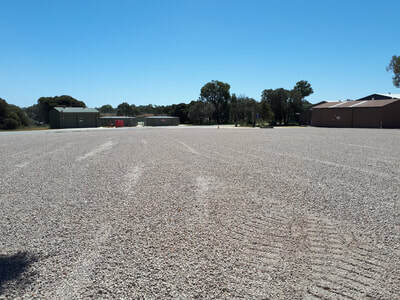 The road base surface is now complete. 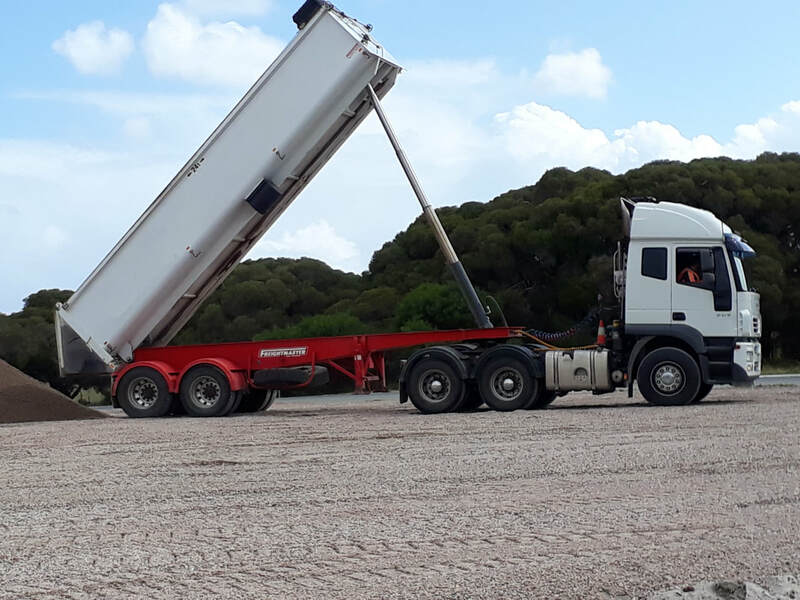 A test drive in the new parking area. 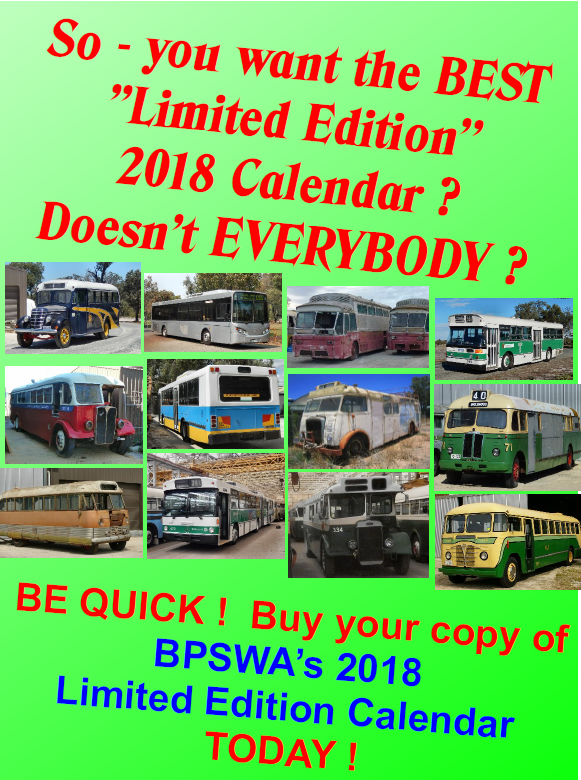 Our 2018 Calendar featuring 12 unique buses within our collection has arrived. Don't miss out - download the Order Form below to place your order today. 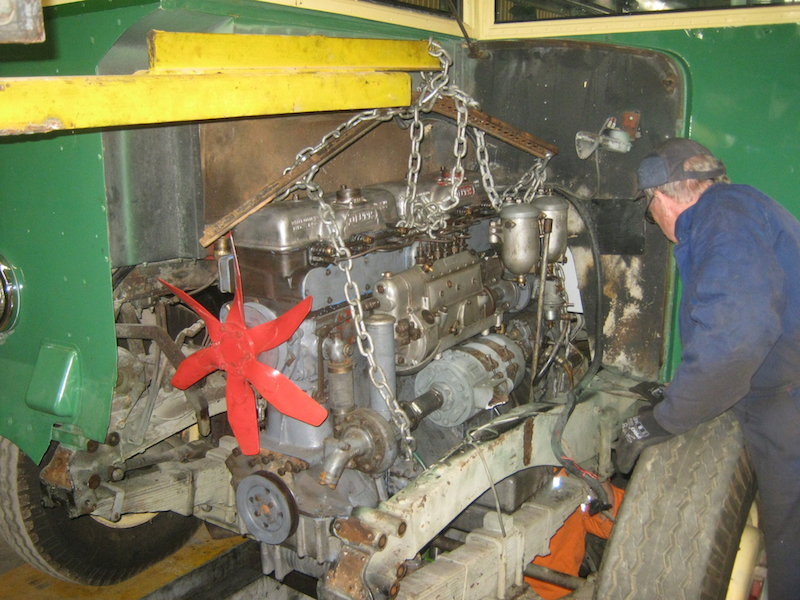 1938 International D35B (SBS15) emerged from the workshop for the first time in 6 months, in order to transfer to the inspection pit for underside work. These few images show its sedate and brief exposure to Perth spring sunshine. 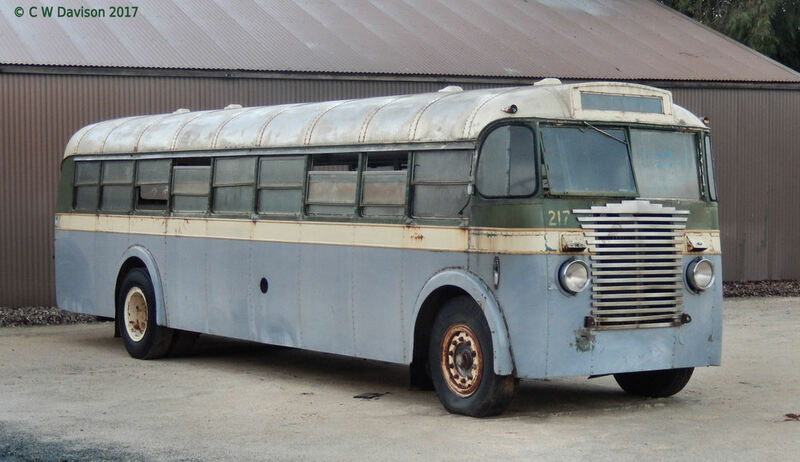 It looked a little dusty, but will be spruced up for a key in-house event in December - A Night of Buses & Stars. 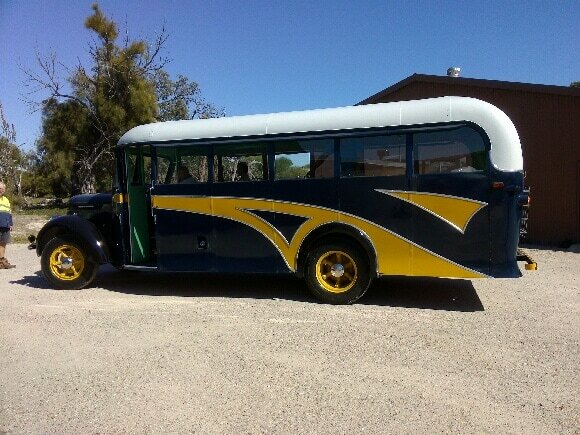 Setting out on a test drive. Test driving around the park. 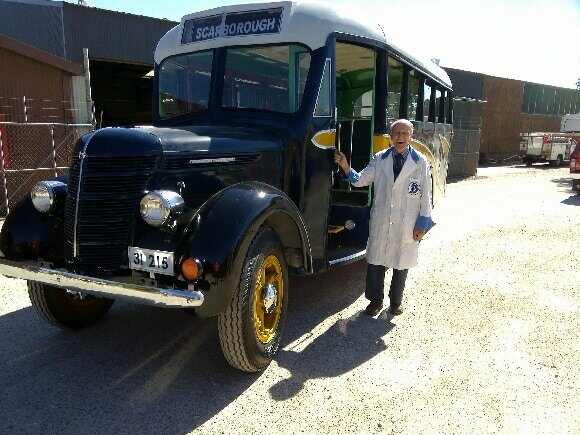 Hazel adds some finer touches to the distinctive Scarborough Bus Services Logo. These two former United Bus company Daimler CVD6 buses purchased by BPSWA recently arrived at our workshop from Mt Walker in Western Australia. 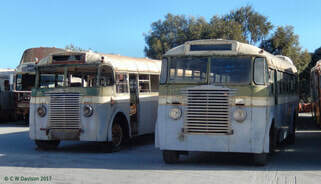 Read more about the history of these two Daimler CVD6 buses. 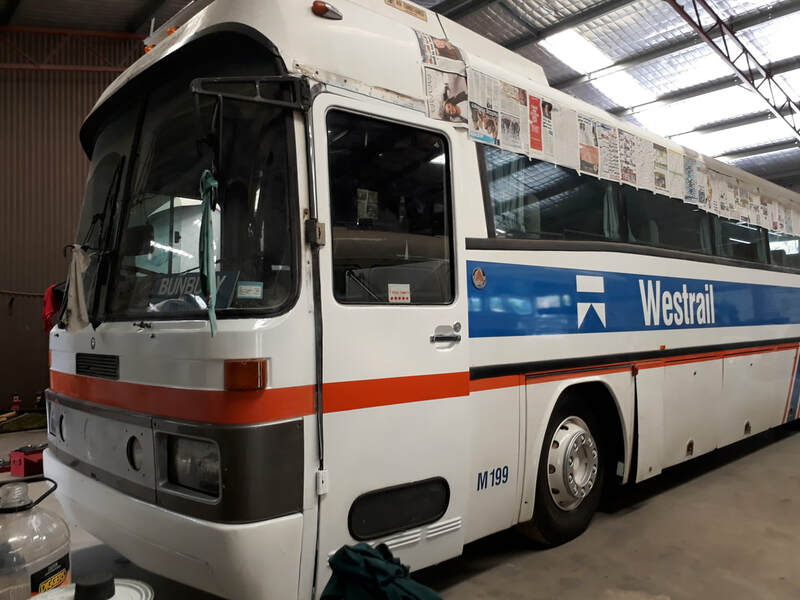 This former Westrail bus M199 has come into the workshop for an inspection and assessment after being generously donated to the Bus Preservation Society of WA. 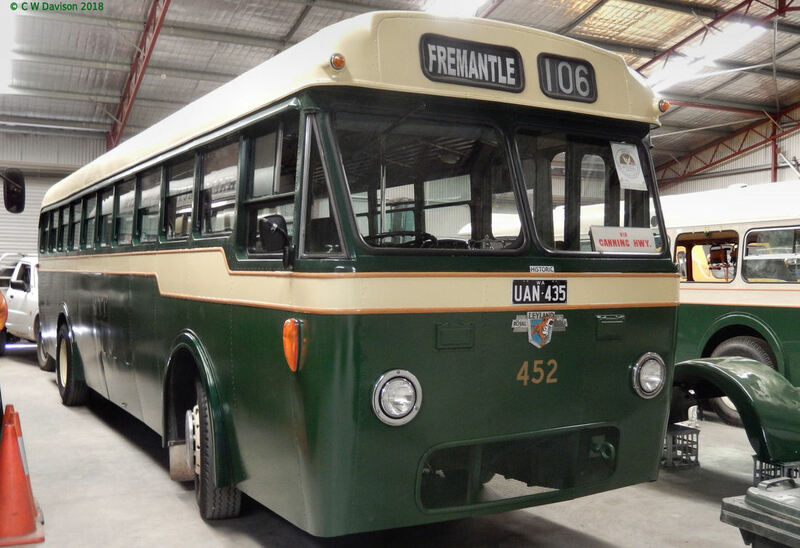 This AEC Regal IV was formerly with the Fremantle Municipal Transport Board (FMTB) and has recently been acquired to be used as a source of spare parts. Seen here with Kalamunda 17 which has undergone restoration and moved to Revolutions Museum for display. 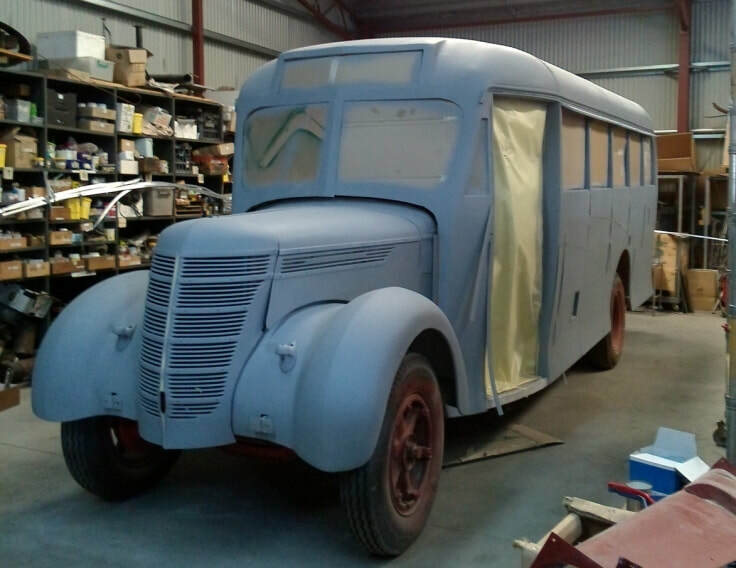 Work is progressing well on the restoration of this 1950's era half cab bus. 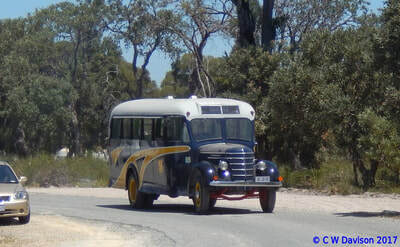 This is an example of a Western Australian Government Tramways (WAGT Bus 73) AEC Regal half cab bus that was later modernised by the MTT (MTT Bus 378). 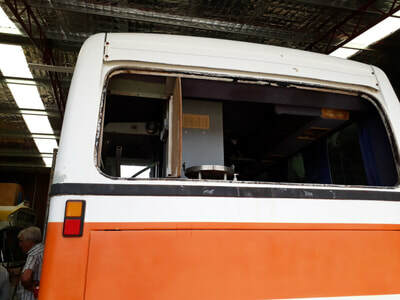 It has undergone a near complete body restoration including replacement of the floor and repair or replacement of exterior body panels. 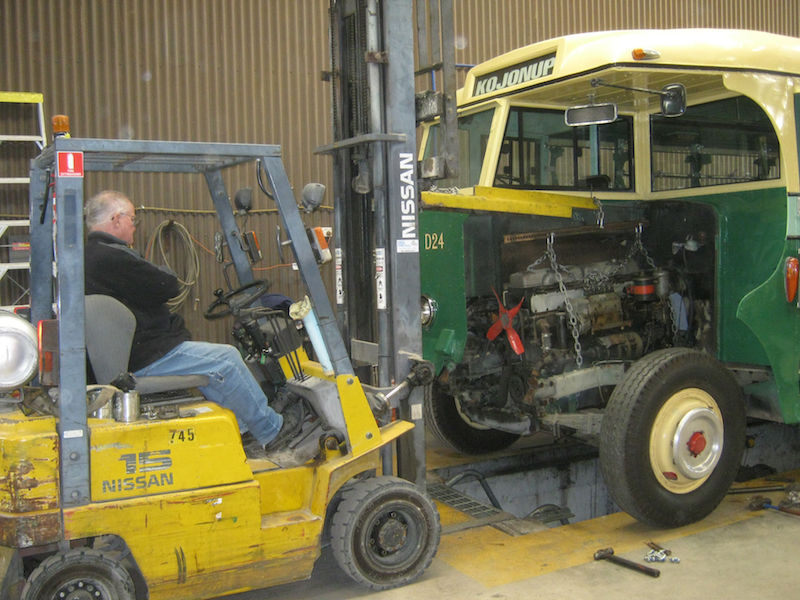 The mechanical components have been checked and repairs carried out and new tyres have been fitted. The destination rolls have been returned to original MTT display format. Work is now being directed to the interior painting and fitting of trim panels. D24 is the sole surviving Dennis Lancet J3 half cab purchased for the Western Australian Government Railways (WAGR) in 1947. 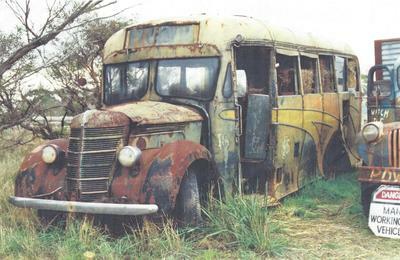 It was 'rescued' from being scrapped and eventually found its way into the BPSWA collection. Even though the Coach body has undergone a full restoration both internally and externally it has had limited exposure to the public as the engine has been a bad 'smoker'. 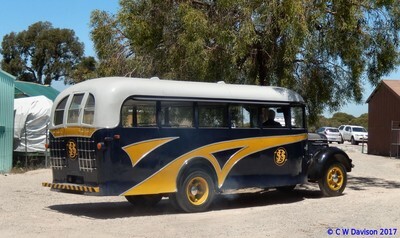 When 'aired' for display purposes at events such as the Classic Car Show, D24 has laid down an impressive smoke trail as it was driven to these events. A 'new' engine for the Coach has been a priority for some time. 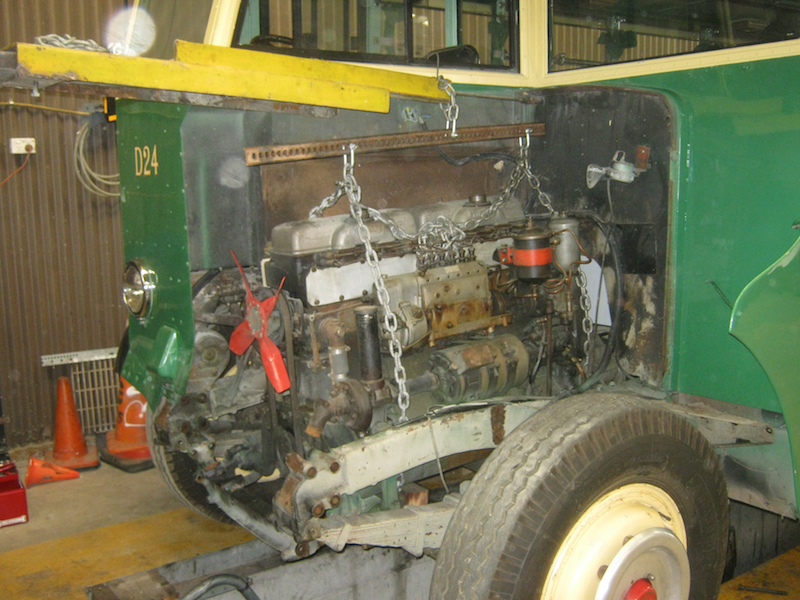 Unfortunately, the lack of replacement parts for the engine has delayed attempts to rebuild the engine. 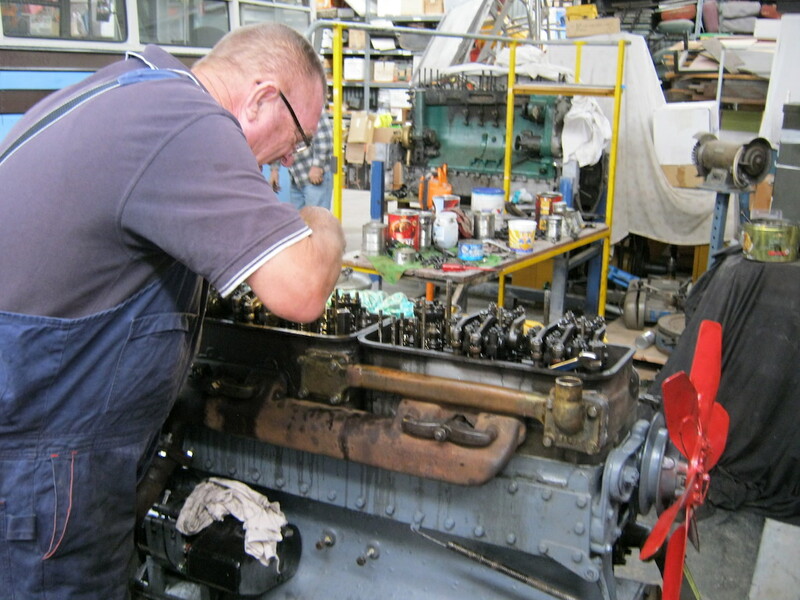 Recently however, work started on rebuilding an engine from 4 engines contributed from various sources and from the efforts of our engineering staff to locate and acquire essential replacement parts for the Dennis engine. 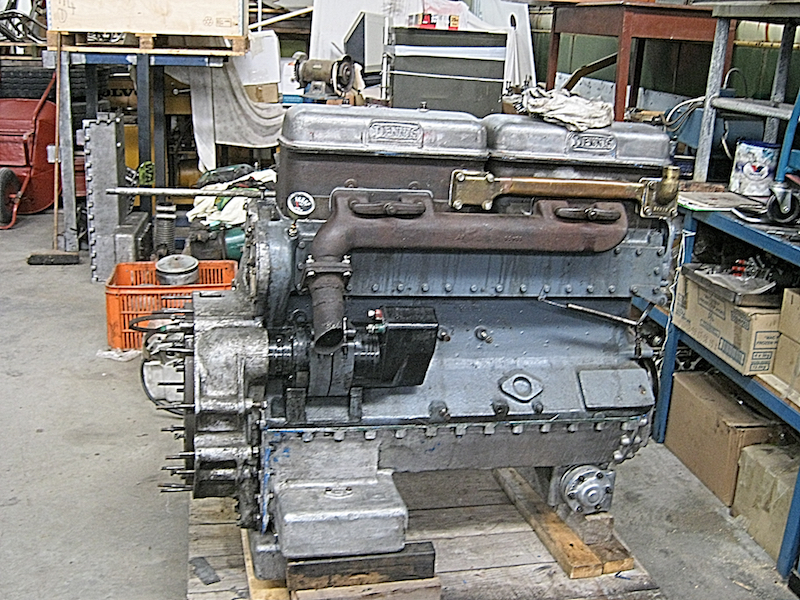 John Young with a stripped down engine for D24. 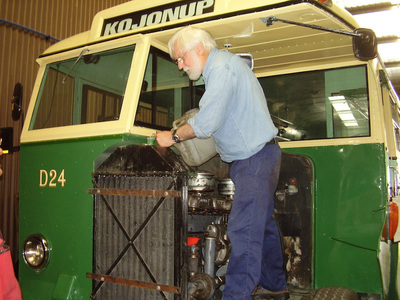 John Young with the first of the rebuilt engines. 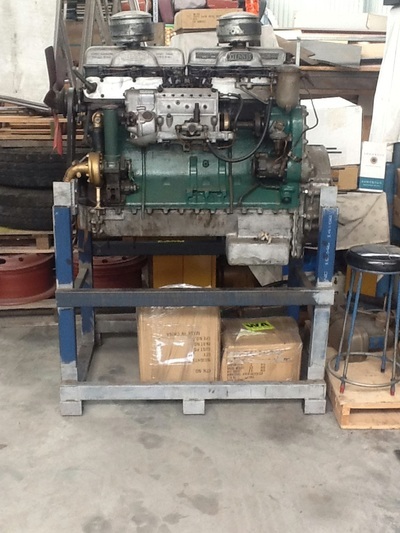 The finished rebuild for D24. 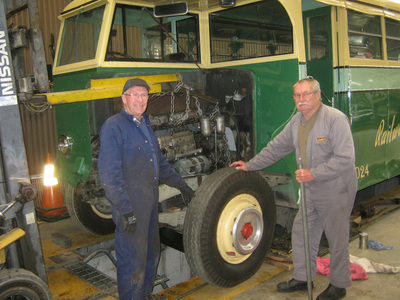 Paul Gentilli and Ken Lines removing D24's engine. Peter Hancey removing the engine. 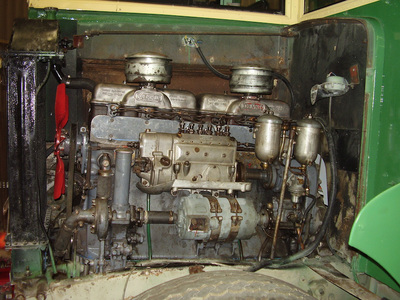 Rolling in the rebuilt engine. The rebuilt engine prior to some fine tuning. 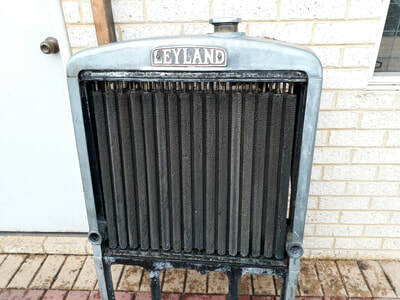 Ron McDiarmid topping the radiator. 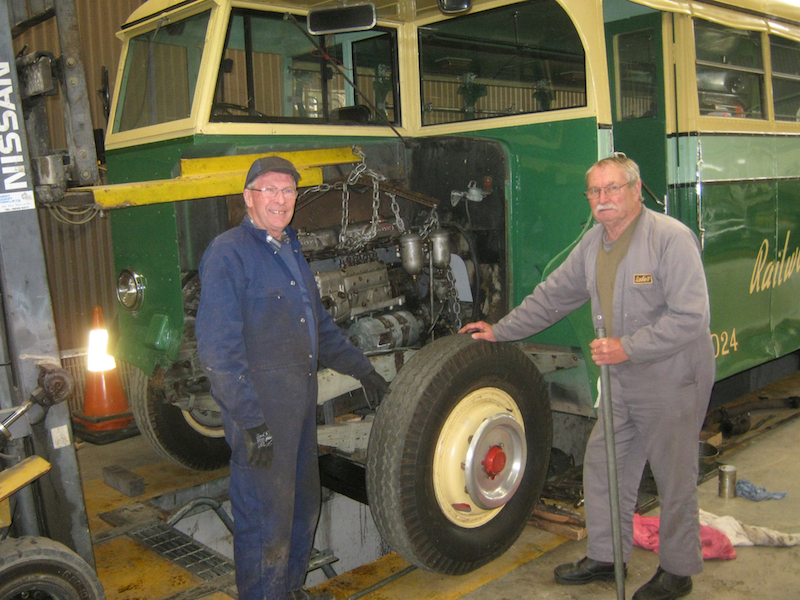 Roger Goring and Ron McDiamid providing some finishing touches. D24 new engine test run. 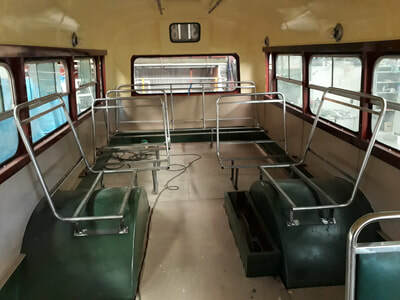 'Refurbishment of Scarborough Bus Service (SBS 15) is well advanced with rewiring of the 'electrics', painting to the interior and seat restoration. The exterior body work has been completed. 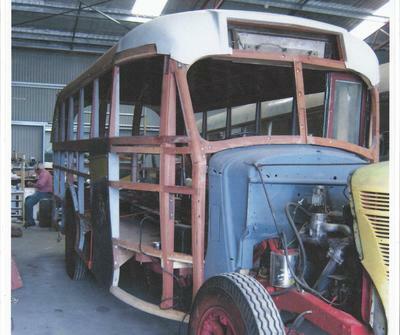 An 'English wheel' was purchased to manufacture and shape flared panels for the rear of the bus as the original panels had disintegrated and replacements were unavailable. 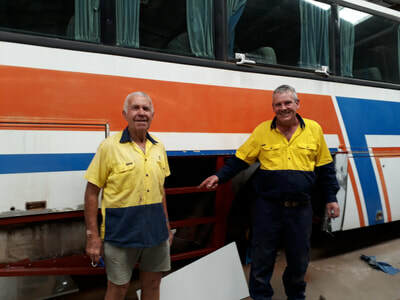 Damaged roof and front panels have been repaired and the bus has been painted in original Scarborough Bus Service colours. Re-upholstered seats have been fitted and the windscreen and windows have been installed. Final preparation is under way to ready the bus for registration for road use. SBS15 as found on a farm in Gnowangerup Western Australia in 1993 - complete with stored hay bales! 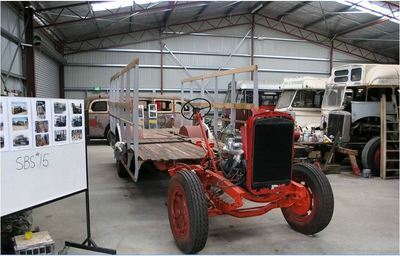 Driver's side view of the wood-framed body restored by David Moseley. Preparation for the windscreen installation! 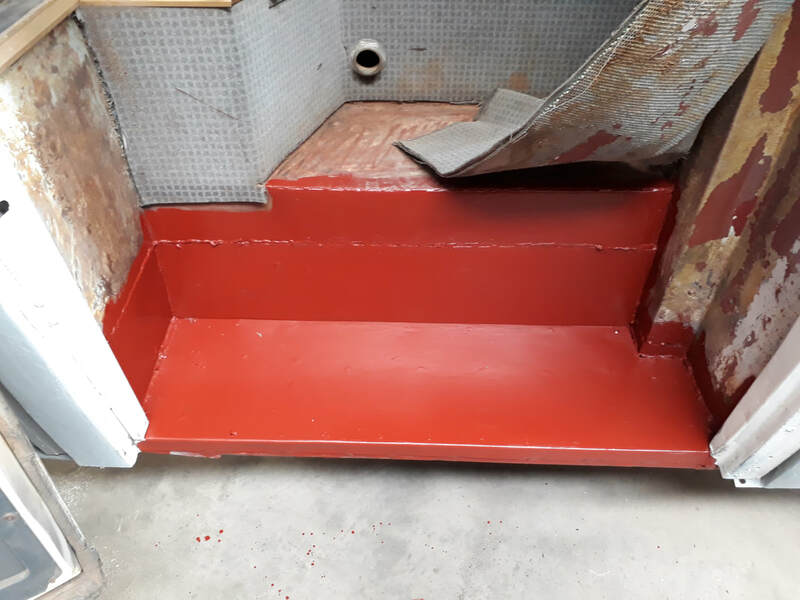 The seat restoration in progress. Original Scarborough Bus Company paint scheme in progress: Pale grey roof, dark blue body, black mud guards, bright yellow side flashes and wheel rims. 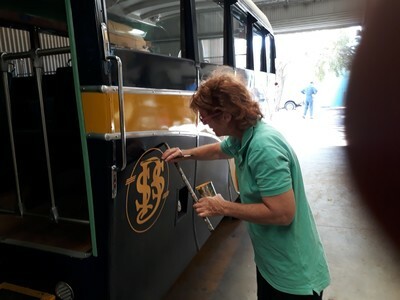 Restoration Team Leader, Pat Hallahan, takes SBS15 for a test run. Kevin Nicholls and Peter Hancey were revelling in the new Plasma Cutter donated to the workshops by Trevor Bindeman. This welcome addition a was immediately put to work cutting up the Daimler chassis that has been sitting outside the west side of the sheds. 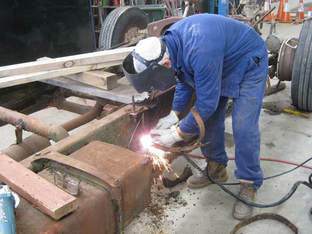 Previous methods of cutting up chassis etc., involved the use of an Oxy torch and Angle Grinder to cut the large steel sections in chassis into a manageable size for disposed. This can be expensive with the cost of consumables such as gas and cutting wheels. 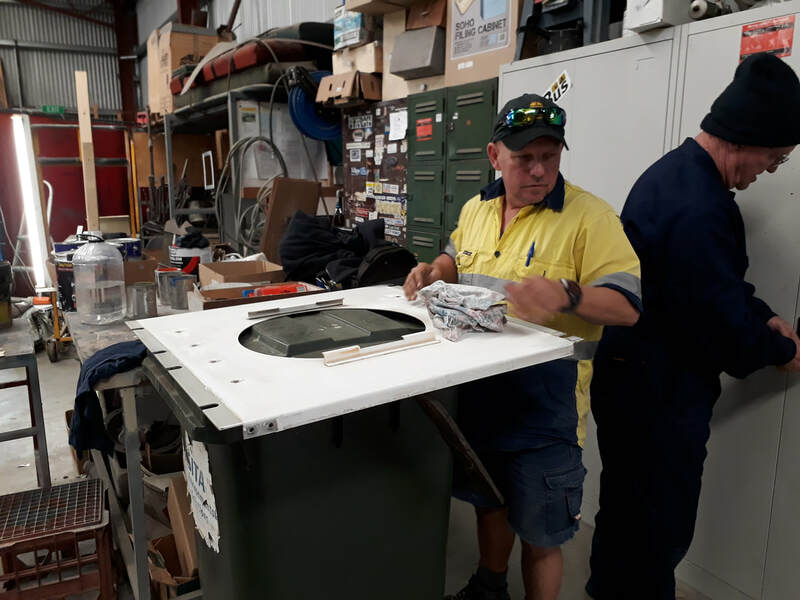 The addition of this new piece of equipment will make the job easier (and quicker) and reduce the overheads in the workshop. The plasma cutter is a metal cutting machine that utilizes gas blown at a high speed from the nozzle of the tool. Getting the right nozzle for the job is important and Trevor made a special effort to get some high quality nozzles for the cutting head. 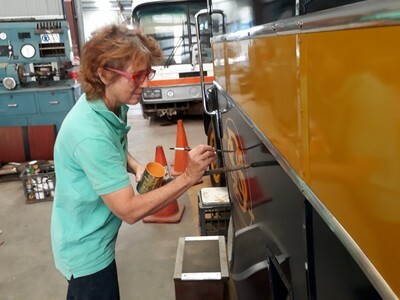 The application of electrical arc to the gas will turn the gas into a plasma which forms a super-hot torch that makes short work of the job of cutting the heavy steel frames in these old chassis. 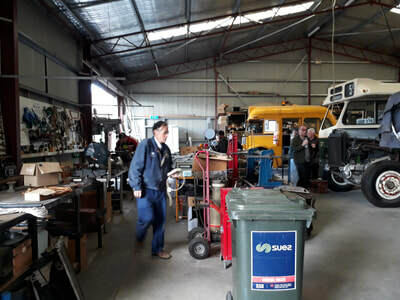 The workshop staff are indebted to Trevor Bindeman who donated the equipment and who helped in the job of breaking up the Daimler. Parts recovery and sorting the metals has gone on 'apace' and the job should be finished quickly now. Thanks Trevor! 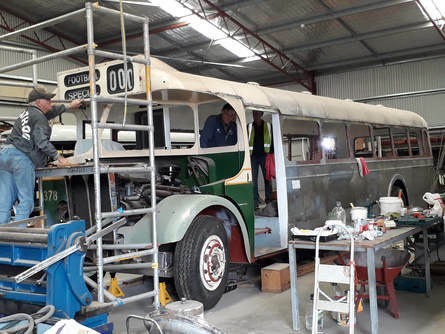 One of our stalwart 'workhorses' the AEC 1965 Regal IV No 654 has been in the workshop these past two weeks with replacement and repairs being conducted to the rear steps. The platform had become worn and was considered a danger to passengers boarding and alighting from the bus so a replacement needed to be rebuilt and fitted. 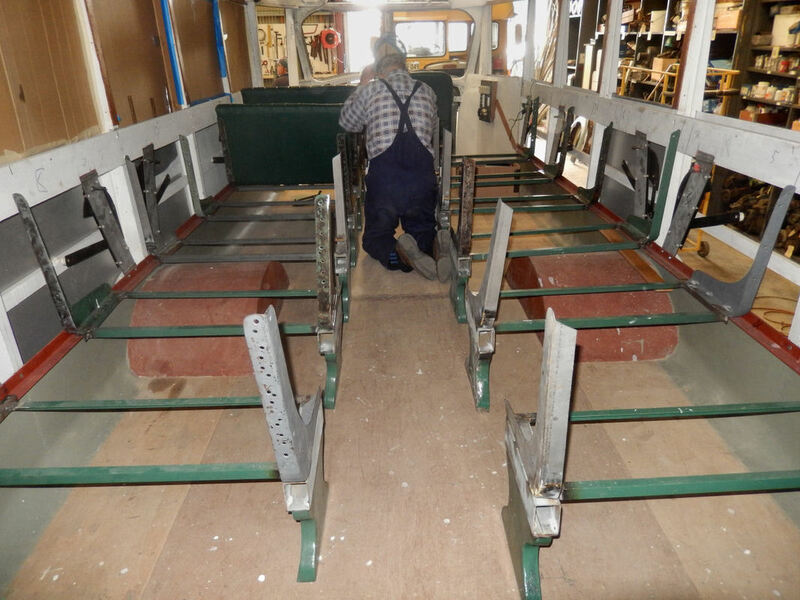 Kevin Nicholls took on the task of removal, rebuilding and refitting the platform and should be finished next week. 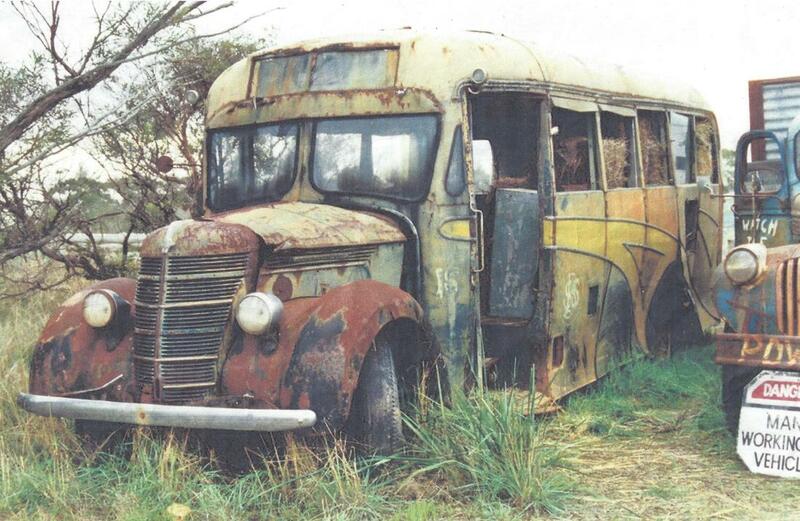 We are looking forward to the bus returning to the operational roster, soon. 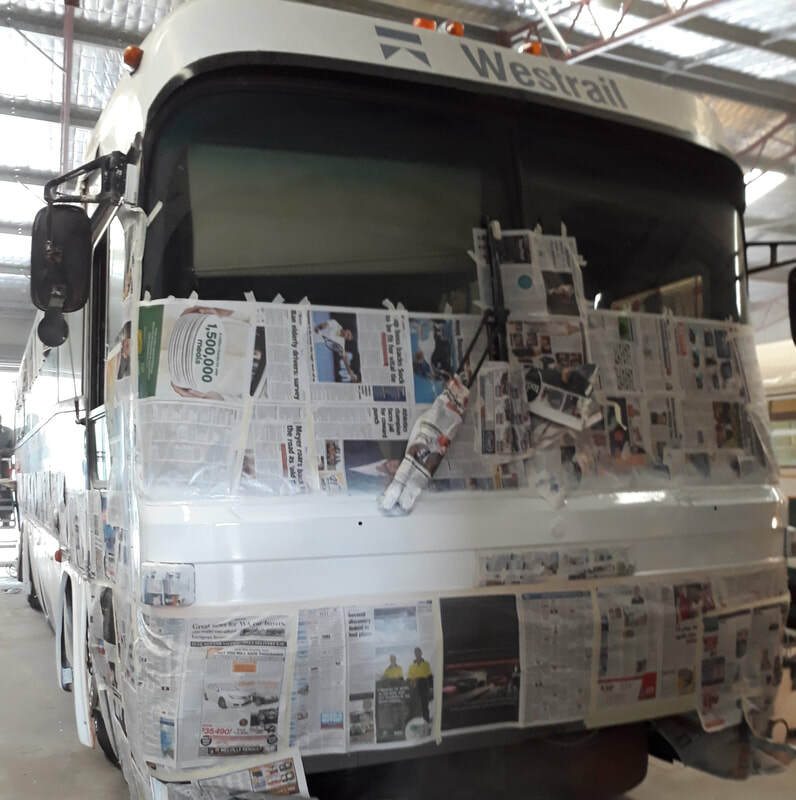 Kalamunda 17 is having some 'rear-end' maintenance! 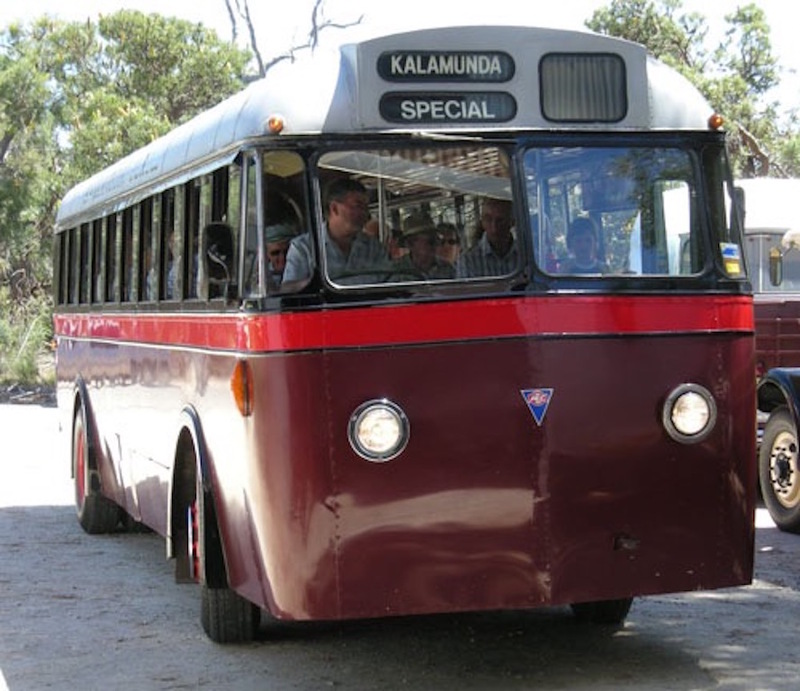 Kalamunda 17 is one of the few buses in the collection with a pre-selection gearbox (with an 'actuator' rather than a clutch). 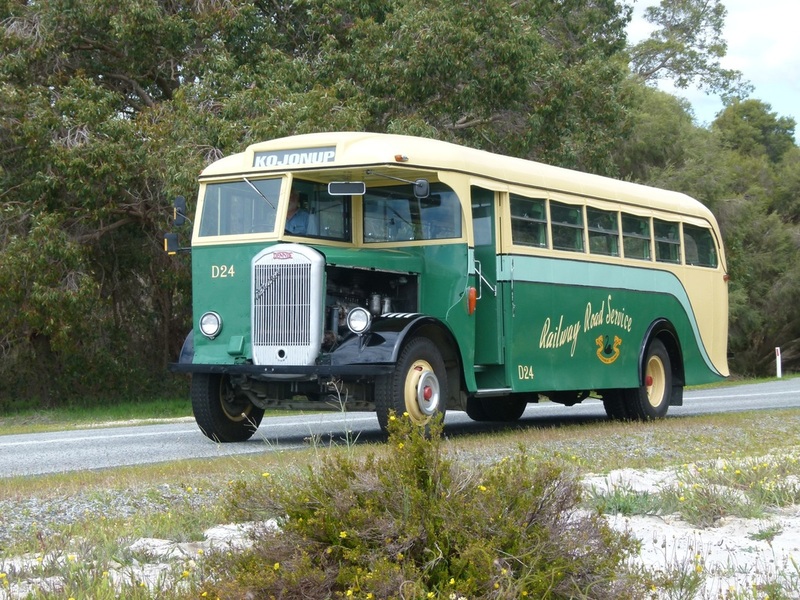 It is beautiful bus to drive, if you are familiar with the gear changing system but easy to 'injure' if driven badly. The bus has suffered from several serious problems over the last few years which have caused it to be 'laid-up' waiting for difficult to find parts to complete the maintenance. The current issue involved a leaky 'bubble' seal in the rear nearside axle which was finally fixed recently. 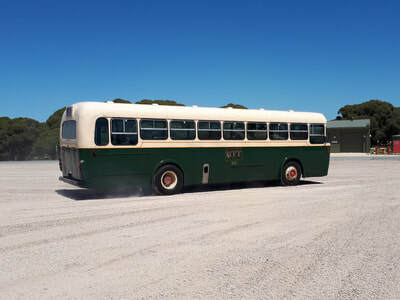 Read more about K17 in detail by following the link below. The 'Horse Bus' has finally received an upgrade. 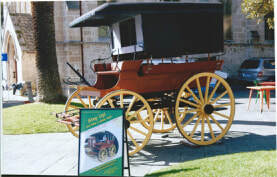 The Horse Bus, (or Bunbury Bus or Wagonette to apply its various titles) is a two horse, four wheeled version of these once popular carriages manufactured around 1900 and often used in Perth up until the 1920's when replaced by motorised vehicles. Our wagonette came into our possession in 2005 but hasn't had much use or attention since then. The material used in the 'tilt' or canopy, was shredded and aging when it arrived, Some bearers and the flooring needed repairs and replacement. Without the skills to do more it was put into covered storage. Removed from the elements the bus had begun to deteriorate and needed careful restoration by a qualified coach builder. 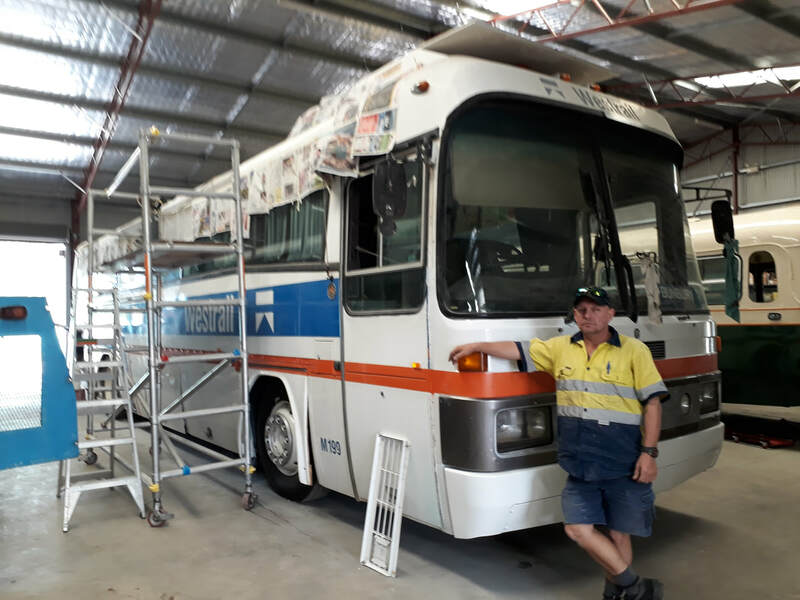 The Council decided it was time to bring the bus up to at least, display standard and a qualified coach builder from Naval base (David Mosely) has undertaken the job of performing the repairs needed. Read more at the link below. 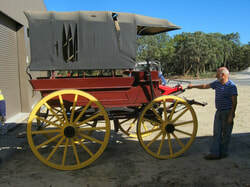 The Wagonette ready for loading to go to 'Naval Base' for its 'makeover'. 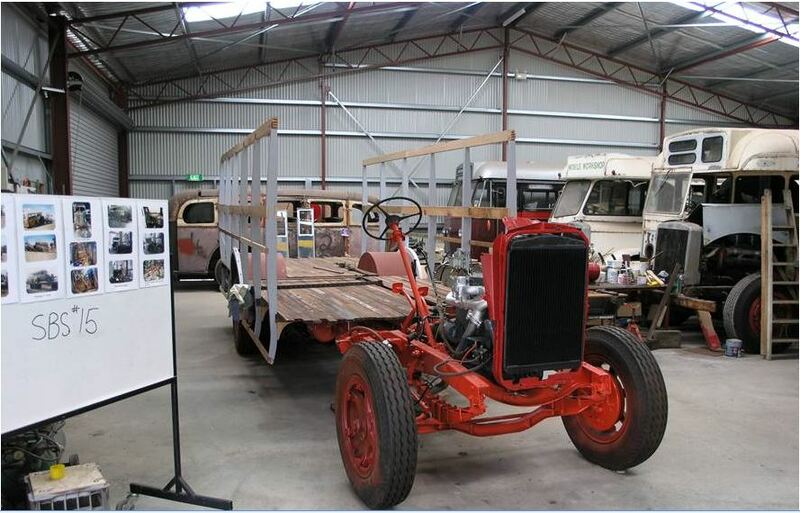 Emerging from the Workshop, all 'Spick and Span'. 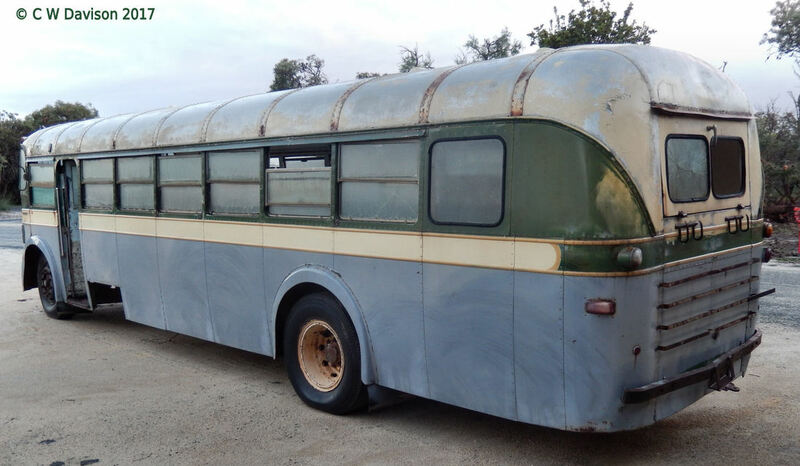 Read more about the Horse Bus. 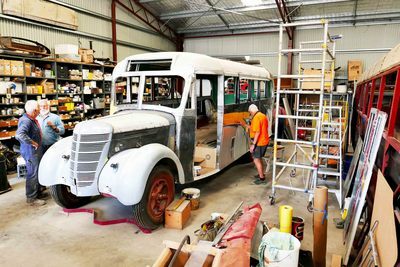 ​​​The BPSWA Workshop is situated inside Whiteman Park along with the Bennett Brook Railway, the Perth Electric Tramways and the Park's maintenance workshops. 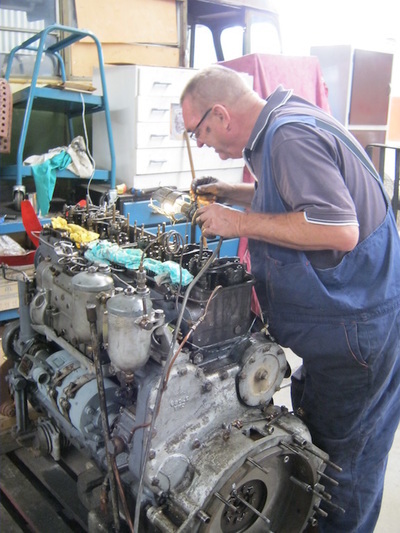 Visits by the public to the 'Workshop area are welcome by arrangement - click Contact Us to request a visit. The Workshop hours are 8am to 1pm each Tuesday. 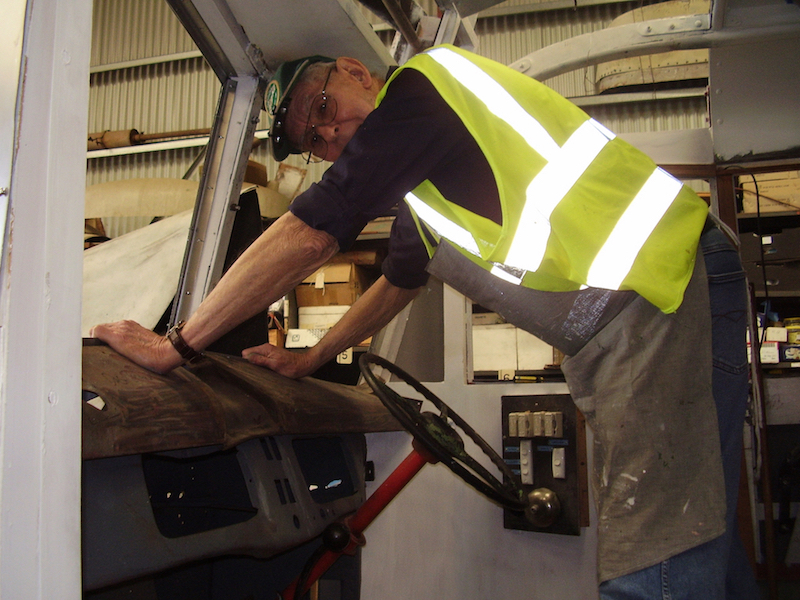 When visiting the workshops, please consider your safety - wear close-fitting clothing and closed shoes. Children must be supervised and restrained at all times. Hi-Vis vests, safety glasses and ear plugs are available for visitors thanks to one of our generous Sponsors - Stocklands. Morning Tea is generally at 9.30am and lunch at 12.00pm. You would be very welcome to join our volunteers in the crib room for coffee or tea and a biscuit. If you would like to join our volunteer organisation and participate in preserving Western Australian history - click Join The Fun. BPSWA has about 2,500 square metres of workshop and undercover storage space at our depot at Whiteman Park. 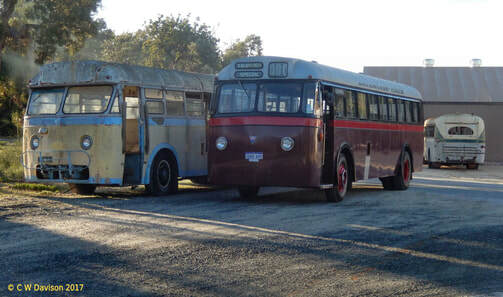 Here we house about 27 buses, some of these we have restored or rebuilt; some are in undercover storage as they are rare or unique and need to be protected from the elements. 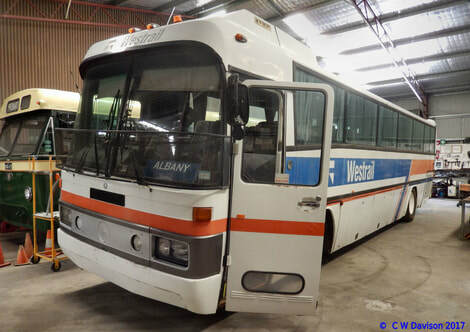 Others (about 15) have been rebuilt /refurbished and operate as part of our unique collection of operating 'in service' buses and need storage undercover. a dedicated section for up to five major projects/rebuilds. Each area has a committed team of trades and trade assistants, and each project has an identified Project Leader working under the management of the workshop foreman. A 'stores' controller, manages the supplies of (largely) recovered parts from previously 'broken up' buses. Usually the 'crib room' has about 25 to 30 people enjoying the fellowship at morning tea or lunch. A small group collect batteries and metal waste from sponsors who continually donate these items to the Society. 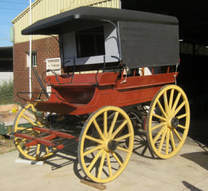 These are 'on-sold' to earn funds for the restoration activities. There is a group of administrators/archivists who prepare material for display; digitise manuals and other documents for use in the workshops; record and manage the archival material and some 20,000 items of memorabilia, books, photographs and other records. A small group of volunteers check tyres, batteries, water, oil and fuel each week for the operational buses in the fleet. 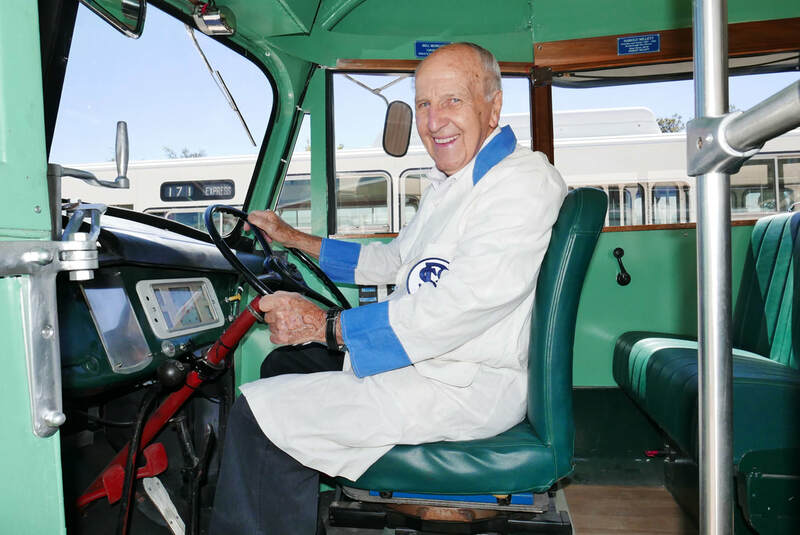 As well, these intrepid group of volunteers service these buses on a rotational basis to make sure that they are available for the weekly running on the Shuttle and Explorer services operated by the Society for Whiteman Park, each weekend. 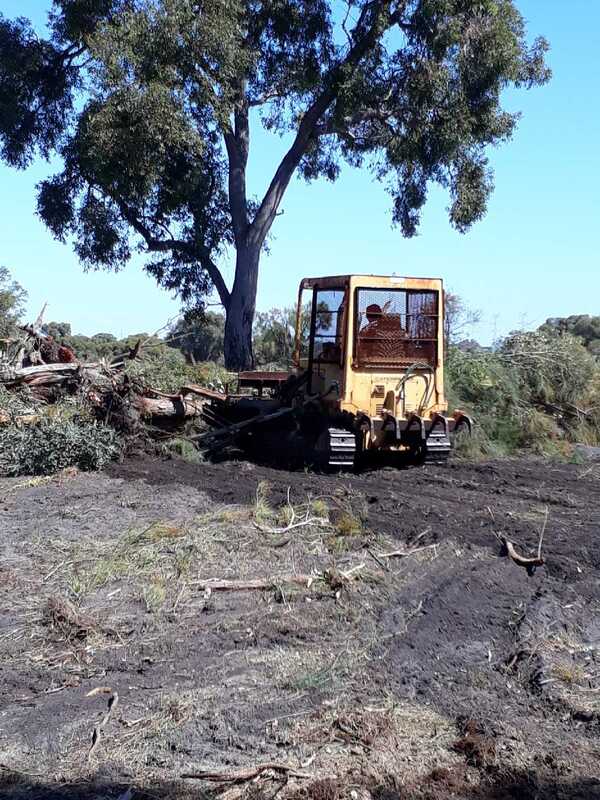 All our members are volunteers who give up their time and energy to work on a range of projects and activities such as these.